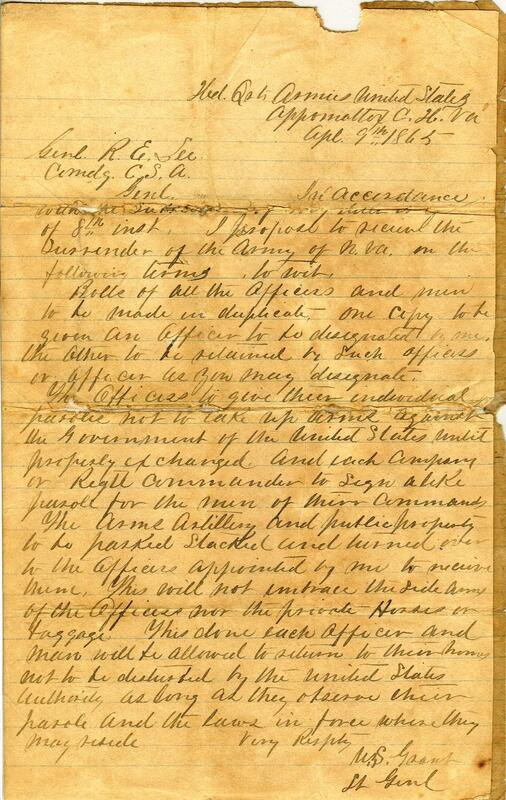 Item Description: Letter from General Ulysses S. Grant to Robert E. Lee laying out the terms of surrender for the Army of Northern Virginia at Appomattox Court House. In accordance with the substance of my letter to you of 8th inst, I propose to receive the surrender of the Army of N. Va on the following terms, to wit. Rolls of all the officers and men to be made in duplicate. One copy to be given an officer to be designated by me, the other to be reclaimed as such officer or officer you may designate. The officers to give their individual parole not to take up arms against the Government of the United States until properly exchanged. And each company or Regtl commander to sign alike parole for the men of their commands. The Arms Artillery and public property to be parked stacked and turned over to the officers appointed by me to receive them. This will not embrace the side arms of the officers nor the private horses or baggage. This done each officer and man will be allowed to returned to their homes not to be disturbed by the United State authorities, as long as they observe their parole and the laws in force where they may reside. This entry was posted in Southern Historical Collection and tagged Appomattox Court House, Army of Northern Virginia, Civil War, General Robert E. Lee, General Ulysses S. Grant, surrender, Virginia. Bookmark the permalink.